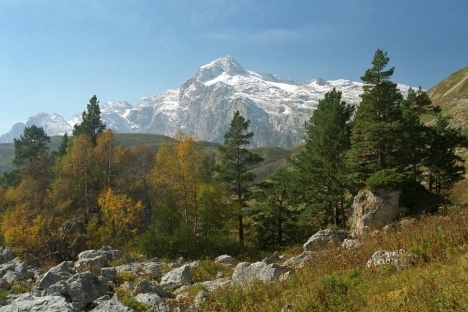 The Republic of Adygea offers refuge to endangered species and fascinating wildlife to hikers. While the Caucasus are mostly known outside Russia as a place of conflict, they have much to offer hikers, backpackers and others adventurous tourists. Hikers in Adygea’s mountains can experience a whole array of vegetation zones: glaciers, jagged peaks and scree fields loom above overgrown subalpine meadows featuring dozens of flower species, dense Caucasian fir and chestnut forests. On the other side of the mountains is the subtropical climate of the Black Sea. The western Caucasus are amazingly diverse. In 1999, UNESCO declared a 300,000 hectares a World Heritage Site, preserving the setting and the wildlife for future generations. The area was eligible to receive the designation partially because of the more than 4,000 plant species that can be found there. Additionally, it is home to the Caucasian wisent – a nine-foot-long creature with shaggy brown fur. In 1888, Tsar Alexander III became the first Russian ruler to recognize the significance of the animal, which was already then close to extinction. He hired an Austrian ranger to go to the Caucasus to protect them. However, the last wisent died in 1927 during the turmoil of the Revolution and civil war. But this is not the end of the wisents’ story. In 1908, Tsar Nicholas II gave a wisent to German naturalist Carl Hagenbeck, and even after the revolution, it was still living in Boitzenburg, near Berlin. This wisent fathered seven calves, which were brought back to Russia in 1940. By the mid-1980s, 1,500 wisents were again grazing in the shade of the mountains, but the difficult years of Perestroika led poachers to kill many of them. In 2000, there were only about 135 left. Since then, however, the number has grown again to 550 and in order to keep these wisents from becoming victims once again, along with brown bears, golden eagles and ibex, the German Nature And Biodiversity Conservation Union (NABU) is helping the national park promote ecotourism. In the last few years, Adygea has evolved to become one of Russia’s most important rafting areas. Travelers in search of thrills can go rafting on the Belaya Reka, also known as the White River, which was conquered for the first time in the 1960s by a timber raft strapped with car inner tubes. Tour operators offer trips of 2 miles and more to beginners, although the canyon of the rocky mountain river can be traveled for up to 10 miles and has several highly difficult areas. Those who prefer things a bit drier and more comfortable should set off with a mountain bike or else put on their hiking boots. Tour guide offer one-day tours on the Lago-Naki Plateau, but to really see the sites, visitors need more time. The famous 30-day tour past the enormous Fisht and Oshten Mountains to the Black Sea is particularly delightful. For those not up to hiking boots and a heavy backpack, tours are available on horseback. It takes several days to travel over the mountain ranges to Dagomys on the Black Sea or Krasnaya Polyana, where the 2014 Olympic Games will be held. There are flights from Moscow to Krasnodar, and from there, visitors can take a taxi to Maikop, the capital of Adygea. Many tour operators offer a transfer from Krasnodar. Those who hike to the Black Sea over the mountains can fly back from Adler-Sochi Airport. On the way to the Lago-Naki Plateau, the Gornoye Nastroyenie tourist camp offers a magnificent viewing platform. An overview of accommodations in the area can be found at www.lagonaki.ru. The hotels are for the most part simple, but clean. In the nature conservation area, you sleep in small lodges. The Fisht Mountain Lodge is ideally placed at the foot of the mountain it’s named for. The Caucasus are known for their outstanding cuisine. Particularly enjoyable are shashlik, dolma, fresh tomatoes, herbs and a glass of vodka consumed in the fresh air. At www.nabu.de/downloads/international/Adygea_ITB.pdf, travelers can download the brochure of the Nature And Biodiversity Conservation Union (NABU) in Adygea.